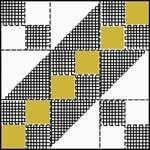 This lively angular pattern is an energetic combination of triangles, oblique rectangles, oblong rectangles and squares. 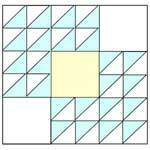 The quilt block pattern is comprised of components created by piecing together triangles to an oblique rectangle, two triangles to a triangle and joining oblong rectangles to the resulting squares. 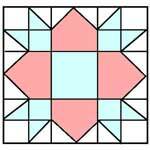 By alternating the 10-inch quilt block with 10-inch plain-colored blocks, you create an animated and energetic quilt that merely needs a border around the four sides to complete this colorful, geometric quilt. 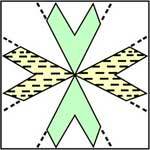 Alternatively, a Pineapple or Four Flowers quilt block can be substituted for the plain blocks to create a more complex and interesting quilt top. 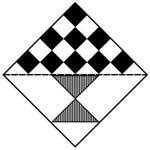 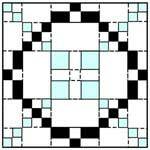 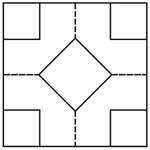 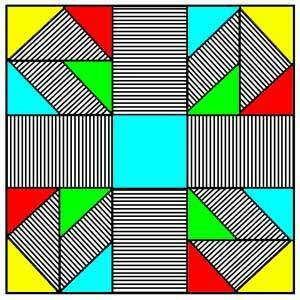 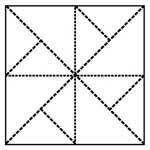 Click image to print the 5" block of the Jack in the Box Quilt Block Pattern.